This time last year Floodstop temporary flood barriers saved properties from being flooded in Somerset. In November 2016 during heavy rains and rising flood waters at a pond on Summer Lane in Weston-super-Mare houses were soon to be flooded. Glendale a service provider for North Somerset Council responded quickly, distributing flood defence barriers, and supplying a telehandler to help the fire and rescue service dissipate the water from the pond. 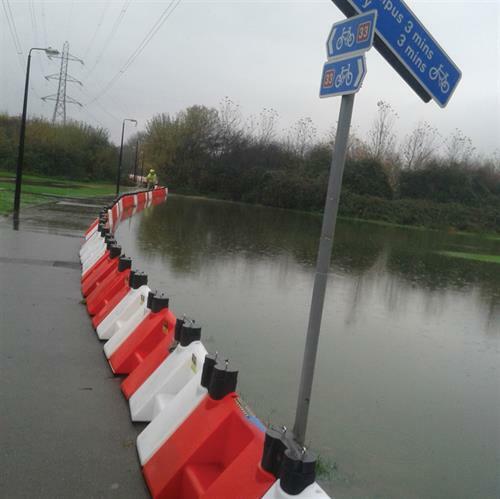 David Buckley, contract manager at Glendale, said:“North Somerset Council asked us to undertake the distribution of flood defences as part of our service delivery in the district last year, and we’ve been undertaking flood defence training days in preparation for an event such as this.